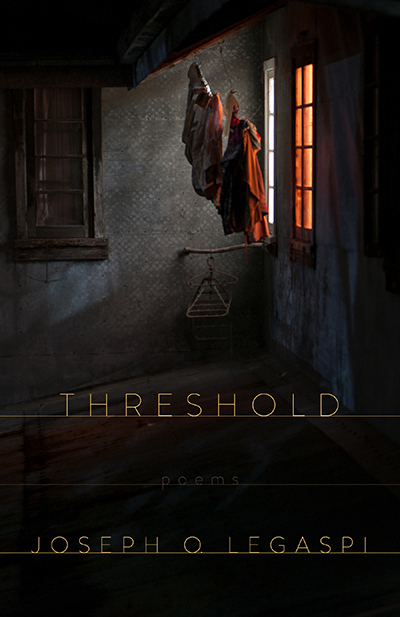 Since the publication of Threshold (CavanKerry Press) on October 2017 I’ve been doing a lot of readings to promote it. However, with a full time administrative job (and teaching an undergraduate poetry class on top of it), I’m unable to travel much outside of New York City, my home. Which actually suits me just fine, this city offers more than enough bounty and, besides, I miss it desperately when I’m away. But for this Verse playlist, I’ve decided to assemble a set list of sorts to provide a taste of what it’s like at a Joseph O. Legaspi reading. I prefer and tend to share the stage with other writers, hence, this here is a 10-15 minute set, depending on the amount of mic banter and/or podium nuttiness. face, feathering into alabaster, a masking. and reveal: boy and actor, flesh and porcelain. does to her son. Escorting him to the stage. shift health, rouge like smolder of the cheeks. From "Threshold" by Joseph O. Legaspi (CavanKerry Press, 2017). Reprinted with permission of the author. explains Olga over breakfast at an artist colony in Vermont. up her arms. Again I find myself in the company of women. the drizzle. The moose vanished into the quivering spring thicket. women arrived, they searched at length, locating the young male dead. They dragged, then tied the stag onto the pickup and drove off. between her teeth. What did it taste like? the girl asks. Meat, Olga shrugs, it tasted like pure meat. between his legs like a rabbit’s foot. for fruit-picking, or prehensile expedition. grace of Filipino coconut boys in provinces. in their shared ocean life in the tree’s ether. and vigilant as a hatchling fish expulsed from its father’s mouth? I feed starry-eyed at the bottom. Am I not your boy? guava for my ripe mother? Sepal not calyx nor calendula. that raids trash bins, feasting on eggshells like shattered light? mirror? Am I no one’s Promised Land, of distant adoration? a darting, cautious sea anemone fish, am I not? A boy visits the zoo, and weeps. into a hole as protection from alligators, predators. encased in the carapace and plastron of its bony igloo.